Other key grain producers have also reported shortages, causing the price of wheat on international commodities exchanges to rise more than 50% since the beginning of July. Grain prices on commodity markets shot to near two-year highs last month as investors digested worsening news of the Russian harvests. The FAO is concerned at the speed at which prices have increased over the last two months. Its economist, Abdolreza Abbassian, said the latest Russian move to extend the ban would prolong the "volatility and anxiety" already on the markets. But the UN agency has stressed throughout that the situation is very different to the food crisis two years ago. Prices are currently lower, production levels higher and stocks more abundant than during the 2007-8 period, when shortages sparked riots across the world. "It still does not mean that we are going to have a crisis," Mr Abbassian said. "It does highlight a very big problem here: a very large exporting country with a great influence on the market can make unilateral decisions like that. It causes disturbances of the market." The effect of rising wheat prices is reflected in the FAO's global food price index, which covers 55 food commodities. This week's report said it had hit its highest level for two years in August, largely driven by higher wheat prices. Last month's 5% rise was the biggest month-on-month increase since November 2009, the FAO said. 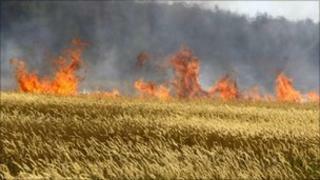 Higher grain prices could feed through to products such as bread and beer. But as they are also used as animal feed, they could also drive up the prices of dairy products, eggs and meat. Analysts suggest that competition could soften the impact on consumers, with retailers and producers unwilling or unable to pass on in full higher raw material costs to shoppers. Some big food companies have also already signed future supply contracts at prices that are lower than on international commodity exchanges. Rises will be felt more keenly in developing countries, where food makes up a bigger proportion of household spending. Higher prices caused people to take to the streets in the Mozambique capital Maputo this week, resulting in violence in which seven people were killed. Pressures such as a weakening currency have caused bread prices in the southern African country to rise 30% so far this year. "There are other issues at play there - which is not uncommon in poorer countries," Mr Abbassian told BBC World News. "Even a small increase in the price of food, which is so important to them... can spark a problem. "Food prices, and wheat in particular, are so important for food security and even the political stability of countries." Should we fear high wheat prices?